Sometimes a performance is dominant enough that a player on a losing team earns the honor. 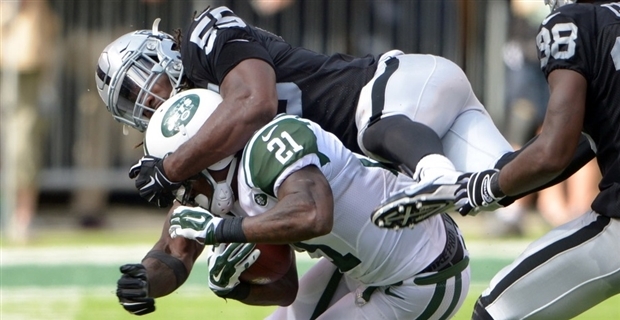 Such is the case with Oakland Raiders linebacker Sio Moore. Moore (Connecticut) recorded 11 solo tackles, had two assists and also forced two fumbles in the Raiders' 19-14 loss to the New York Jets on Sunday. Moore was all over the field in the loss, and chances are the Raiders are going to need more performances like this throughout the season from Moore and the rest of the defense. Oakland's offense was suspect with rookie Derek Carr at the helm, and until Carr can progress to where he can lead the offense with more play-making consistency, the defense is going to have to carry the Raiders. Moore certainly took a step in that direction with his efforts on Sunday.